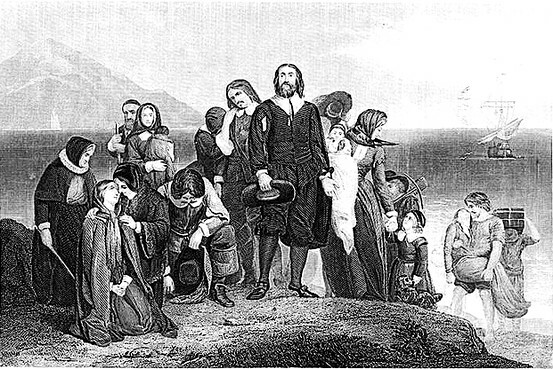 When I celebrate Thanksgiving, I always think of the intrepid travelers (pictured above) who came to the northeast of the New World in the month of November, for gosh sakes, of 1620. They were pious dissenting Protestants, and they came for intellectual freedom. But what they weren’t was intellectually humble. What I mean by that is: they believed that they had the right and the ability to make up their own minds about religion. They were so sure of this, they staked their lives and the lives of their families on it by traveling across the ocean to the “desolate wilderness” as their chroniclers described the land on which they landed. Yet “intellectual humility” is the term which advocates of the free interchange of ideas recommend to describe the proper state of mind. What do they mean by that? Social psychologist Jonathan Haidt, author of The Righteous Mind: "Why Good People Are Divided By Politics” is a staunch advocate of the real interchange of ideas. He’s on an interesting trajectory, being dragged kicking and screaming, as I heard him say, into becoming a libertarian from a tradition of left liberalism. Well, he’s not quite there yet. But he’s doing valuable work, fighting against political correctness and for free speech. One of Haidt’s et. al most recent efforts is the OpenMind website, a platform of activities and information for teachers to use in order to educate their students on the value and processes of free speech. And it has loads of valuable material to help students learn about and become comfortable with reasonable discussions of all kinds of differing ideas. Given the state of education today, i.e. the amount of ideology and practices they’re being taught which mitigate against discussion of differing ideas, this is a laudable tool. Teachers, check it out! Unfortunately, Haidt’s group argue that these tools of expression are important for a “democracy.” I say “unfortunate” because it perpetuates an error of thinking. The U.S. is a democratic republic. Our election processes use majority voting of citizens. But the form of government is a republic, in which governance is indirect, i.e. by representatives, and is based on a system of law to determine criminality and torts, and in which rights are protected from attacks by the majority. In a pure democracy, citizens vote directly on what the government should do, including, sometimes, ruling on sentences for crimes (see Socrates’ conviction). And I think it’s unfortunate. Because “humility” is defined as “the quality of condition of being humble; modest in opinion or estimate of one’s own importance, rank, etc.” by Dictionary.com. And this is a very similar definition to those in other dictionaries. I know that what Open Mind and others are trying to mitigate against is the unthinking, the un-careful forming of conclusions. It feels too good to be “right.” Uncertainty is scary. How do you know what to do if you’re uncertain? But it’s a dangerous practice to blind oneself to the truth in order to save one’s feelings. And it’s only too easy to get one’s sense of self-worth, one’s self-esteem, from being “the one with the right opinion.” In fact, it can be very hard to let go of wrong conclusions. It can be hard to listen carefully to the ideas of an ideological opponent. A person’s self-image can get in the way. But is humility” an accurate description of the right frame of mind? As I understand it, they want people to be careful with their conclusions, collect as many facts as feasible, consider the arguments and opinions of others as sources of possible truth, and keep in mind that they don’t know everything and can be wrong. But anyone who wants to come to rational conclusions has to have a good level of self-confidence in his or her own mind. How else can they judge the value of others’ input, or the exactness of their own conclusions? But I think the better and more accurate way to describe the right approach is to have an “active mind” - which means one restless for truth and facts, vigilant for counter-examples to one’s own conclusions, open to hearing counter arguments to beliefs, and a willingness to change when confronted with evidence. In fact, if one builds one’s self-image on loyalty to the truth, no matter where it takes one, one’s self-esteem will never be challenged or shattered by new facts and ideas. This, in fact, is a description of a truly confident mind - and that is the state to cultivate. Another very valuable tool for parents is Lenore Skenazy’s Letgrow website, chock full of information, ideas, and recommendations for parents. It’s aim is the “futureproof” kids by helping them become resilient.